MORE FLOODING ON THE EAST COAST: Susan Candiotti reporting from New Jersey and AC talked with Todd Trazaskos from Vermont. Ask Anderson - Are You a Potterhead or Gleek? In this video, Anderson answers @silverflutefly's question, "Are you a Potterhead, Gleek, or zealous fan of some sort?" You know, if this was 2005, you’d be in Louisiana covering Katrina. I’m wondering, if the syndicated show was debuting at about the same time, could you have stayed there? What would you have done? A month is a long time in television. And I stayed a month in the New Orleans/Mississippi Gulf Coast during and in the wake of Katrina. I stayed a month in Haiti after the earthquake. I stayed in Israel for a month during the fight against Hezbollah. But I think we will have enough shows on tape to cover any assignment that I need to do for CNN. It’s important for me to still be able to go out into the field and to still be able to cover breaking stories and important stories. So I think we will work it out. A lot of these stories are stories that also would be of interest to a daytime audience if we can tell it in the right way and some of the stories have resonance with a daytime audience. We will certainly incorporate them into a daytime show. I think we’ll make it work. When you say it’s not a news show, it makes me curious. What’s a prototypical Anderson show? Who’s the guest on a prototypical Anderson show? The commonality they all have is that they will have my personality throughout and my engagement and my interest throughout and the audience will be also an important part of every show. I don’t think a lot of shows are really using the audience much anymore except to applaud in and out of commercial breaks. I want to be in the audience, I want to be talking to the audience and that also includes the audience at home via Skype and online, but I think there’s not going to be a prototypical show. We want it to be entertaining and informative. Those are the two things that we want our shows to be. Whether the topic is a provocative social issue, whether it’s a big celebrity interview, whether it’s an interesting pop culture phenomenon, we want it to be informative and entertaining. I think it’s daunting your first show airs on Sept. 12, a day after the 9/11 commemoration. How do you set a tone after a day like that? I don’t know. I honestly don’t. We have talked about it and we’re still trying to figure out what we’re going to do on that first day. We have a couple of different options and we’re waiting on some other things. There will be a week run up [of 9/11 stories] beforehand. So it’s a question of, do you continue to do things or is it a start of a new week and do you [change the topic]. I think it’s a decision we will make late in the game, just prior, to see what we think we’re going to do. I’m amazed how people like you find time to take a breath, with this new show, your duties at CNN and prepping for shows. Do you have something like your own version of Seven Habits of Highly Effective People? I am always hesitant to kind of talk too much about it because, you know, I go to Afghanistan and spend time with Marines who are out on patrol in Helmand Province and what they go through on any given day makes my quote unquote busy-ness pale in comparison. So based on a real job, I know I am extraordinarily lucky and I am happy to be this busy. But I definitely don’t have any tricks or anything. I have actually tried to stop multitasking because I actually now try to mono-task. There’s so much information out there — especially in news — and I am constantly consuming information and making decisions about what’s going to be on what program. So now I think it’s very easy to multitask ourselves to the point where we’re no longer focused on where we’re at in any one moment. So I try now to only do one activity at a time. If I am talking to you on the phone, I am not looking at my Blackberry. Now, I am just eating with friends or family or whatever. Mono-tasking seems the reverse of what I should be trying to do, but otherwise I think I would spin off and become a crazed television person. I want to actually try to still be a real person. To read all three pages of the article just follow the link. The interpretation of the numbers come from CNN so there is some spin but still interesting. 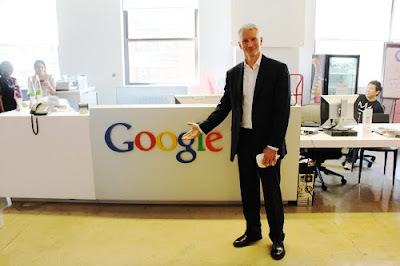 •	CNN’s AC 360 at 8 pm topped MSNBC in the key demo (219k vs. 199k) in August. The show also increased an impressive +74% in P25-54 vs. a year ago – 219k vs. 126k; MSNBC decreased -25% (199k vs. 265k) and FNC’s O’Reilly Factor was up +5% (679k vs. 644k). In total viewers, AC 360 was up +47% (662k vs. 451k); MSNBC was down -15% (817k vs. 964k) and FNC increased +7% (2.910m vs. 2.719m) compared to last year. •	At 10 pm, AC 360 topped MSNBC’s The Ed Show/Docs by +21% in the key demo (267k vs. 220k) and in total viewers (750k vs. 731k) in August. CNN had strong ratings gains at 10pm, increasing 55% in the key demo (267k vs. 172k) and 34% in total viewers (750k vs. 560k) vs. a year ago. MSNBC’s The Ed Show/Docs was up only +8% (220k vs. 204k), while FNC remained relatively flat, +1% (457k vs. 452k) compared to a year ago. In total viewers vs. a year ago, AC 360 was up +34% (750k vs. 560k), while MSNBC grew +37% (731k vs. 534k) and FNC increased just +2% (1.821m vs. 1.780m). To read the entire press release visit our sister blog All Things CNN. Today marks the six year anniversary of Hurricane Katrina. 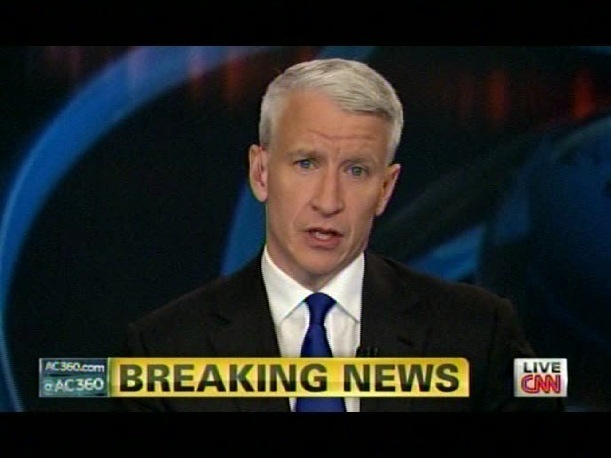 Anderson did an end of year program on AC360 in 2005 that included a segment on the most memorable moments of his Katrina coverage. 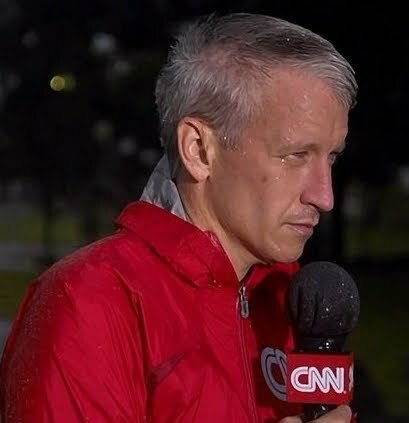 Anderson Cooper began anchoring coverage of Hurricane Irene from the streets of New York City at 6 AM Sunday morning. Here is some of his reporting from the three hours of coverage. And to get us started, we'll take a look back at the classic 2005: Anderson vs. Hurricane Dennis (or should I say the Ramada Inn sign)?! Anderson Cooper was in the anchor chair for all the latest out of Libya and Hurricane Irene, as it approaches the U.S.
We will post the video when it's available. A few weeks ago we featured the bios of two CNN reporters who stood out covering Somalia for AC360. With this weeks Libya coverage we have two more reporters that have done an excellent job and we wanted to share a little background information on them. Sara Sidner is CNN's multiple award winning, New Delhi-based international correspondent and is responsible for the network’s coverage of India and South Asia. Since taking up this post, Sidner has reported on a wide range of subjects spanning politics, business, terrorism, culture and the social pressures the country faces in its drive to become a world power. Recently, Sidner contributed several reports as part of the ‘Eye on India’ week of special programming including the boom in India’s aviation sector, emergence of smaller towns as growth drivers and an interview with one of India's legendary business leaders. She has contributed several stories to CNN's Freedom Project which is exposing modern day slavery in countries around the world. She also covered the visit of President Barack Obama to India, the historic Pakistan floods, the Chile and Haiti earthquakes, Sri Lanka’s volatile Presidential elections, a special on victims of Sri Lanka’s civil war and elections in Afghanistan. Sidner also reported on the Mumbai terrorist attacks, as they happened, from outside the Taj Mahal Palace and Tower in Mumbai. Some of her other stories from the region include in-depth coverage of India’s first moon mission, massive flooding in North East India and across the border in Nepal, and the devastating Myanmar Cyclone. With more than 15 years of television journalism experience, Sidner has covered many stories of national and international importance including one of the worst natural disasters the world has seen when she traveled to Sri Lanka to cover the aftermath of the Tsunami in 2004 and the 2004 U.S. presidential race in Washington D.C.
Matthew Chance is CNN's senior international correspondent based in Moscow. He has reported extensively on major stories for CNN's global news networks from the Middle East, Afghanistan, Russia and Chechnya, Europe and the Far East. Chance led CNN’s coverage of the 2008 Georgia Russia war, reporting from the frontlines. With his team, Chance was the only television correspondent to cross from Georgian to Russian territory, filing reports from Tskinvali, the devastated capital of the South Ossetia war zone. When the conflict ended, Chance secured an exclusive interview with the Russian Prime Minister, Vladimir Putin – the network’s first for eight years. Chance also sat down with Russia’s president, Dmitry Medvedev, for a one-on-one interview. In other assignments, Chance reported from Mumbai, India, where he covered the 2008 militant attacks on the city and the siege of the landmark Taj Majal Hotel. In 2005, Chance reported from the scene of the London bombings in July and carried out investigative reporting on the terrorists responsible for the catastrophe. He also reported on the Tsunami tragedy from Phuket where he documented heartbreaking stories of tourists from 27 nations caught in the disaster in December 2004. In Russia, Chance reported on the Beslan school siege in September 2004 when 344 civilians perished in the three-day standoff between Chechen rebels and Russian security forces. He also covered the Moscow theatre hostage crisis in October 2002, in which nearly 800 people were held captive by Chechen rebels. His reports documented how Russian special forces pumped lethal gas into the theatre auditorium to subdue the hostage takers before storming in. He has also travelled repeatedly to Chechnya, where a bitter war continues unabated between separatist rebels and Russian troops. In the Middle East, Chance reported extensively from Iraq in the aftermath of the 2003 war. He has also spent months documenting the hardships and bloodshed felt by both sides in the Israeli-Palestinian conflict, from Palestinian suicide attacks against Israelis to the impact of that country's military action in the occupied territories. He was the first journalist to interview the Palestinian leader, Yasser Arafat, after Israeli troops lifted a siege on his Ramallah compound in May 2002. He also covered the Israeli siege of the Church of the Nativity in Bethlehem in May 2002. In 2005 he covered the disengagement of Israel from Gaza. And in 2007, he returned to the region to report from the frontlines in the war between Israel and the Lebanese militant group, Hezbollah. As nuclear tensions simmered between India and Pakistan, Chance flew to the central Asian country of Kazakhstan to interview the Pakistani president, General Pervais Musharraf. In the interview, General Musharraf clarified his policy on the use of nuclear weapons. Chance joined CNN in October 2001 when he reported from Northern Afghanistan. As Kabul fell to the Northern Alliance forces, he was the first CNN correspondent, and one of the first Western reporters, to arrive in the city, entering the Afghan capital on foot. He then reported on the emotional outpouring as the people of Kabul reacted to the departure of the Taliban. Between 1996 and 2001, Chance was a freelance correspondent based in Sri Lanka, Bangkok and London. Some of the events he covered on behalf of CNN include the violence in East Timor, the Israeli/Palestinian conflict, the NATO bombing of Yugoslavia and the refugee crisis in Kosovo. He has also reportedly extensively on the troubles in Chechnya, spending almost 18 months in Russia and Chechnya reporting for CNN. Previously he worked in London as a broadcast journalist for the BBC World Service. Chance is British and attended the University of London where he earned a BA in Archaeology and Art from the School of Oriental and African Studies. 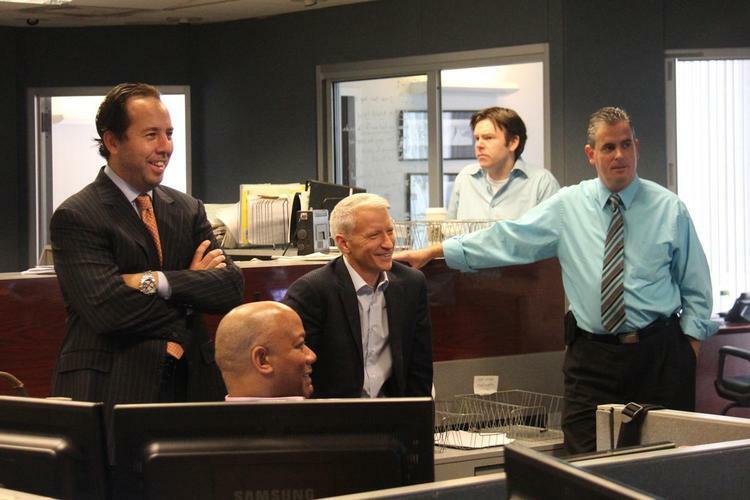 To view a behind the scenes on Anderson's visit photo set, click here. Anderson opened AC360 on Tuesday night by reading a statement from a a Libyan government spokesman about the unfolding drama in Tripoli. Also Cooper mentioned a statement released by Gadhafi and played on Libyan government radio. He then reviewed events in Tripoli today. Do you remember when rumors began flying last year that Anderson wanted to be a talk show host? Larry King was stepping down after a long career as CNN’s premier talk show host, so surely CNN would see the impeccable timing of these two events. Who better than Cooper to take Larry’s place doing celeb interviews, talk reality television, social issues, etc. and switch over to hard news as needed? Sort of like Larry only better. But it wasn’t meant to be and to add insult to injury we got Piers Morgan….but that’s a discussion for another day. So we fast forward to the announcement last September that AC was going to do a syndicated talk show with a subsidiary of Time Warner. When I heard it my first thought was how would he handle mega news days? I knew he would breeze through the mundane days but two big stories on the same day when you have two live audiences booked for talk show tapings was bound to happen. And it did. When Anderson Cooper cracked up during his Gerard Depardieu/pee-pee-pun-filled segment on CNN last week, the clip went viral. Why? Because no human can resist the powerful combination of Cooper’s decidedly goofy giggle and a French actor’s lack of urinary restraint. But apparently the popularity of the video caught Cooper by surprise. That’s right, Cooper. Keep your viral video options open. Saturday night I attended a enthusiastic reception for AMFAR (American Foundation for AIDS Research) The fete was held at Gabby Karan's (Donna's Daughter) delightful Sag Harbor NY restaurant TUTTO IL GIORNO. The food was perfect, the ambiance festive and riparian (we're on the bay), and the staff attentive. Gabby not only was generous with the space, she closed the entire restaurant for this worthwhile cause. A class act. 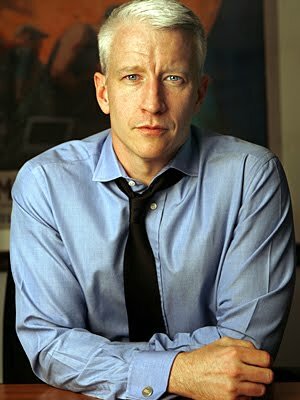 Always the class act was Anderson Cooper who showed up with his Hamptons house guest Kathy Griffin. What a wonderful pair. Fun and serious. Together they're salt and pepper - or tabasco and fire. Anderson and Kathy were clearly well aware of the their roles chatting and posing for picture upon picture. It was refreshing to Cooper laughing and engaging in life; he's a smart man - morphing and blending in as need be.